This note was written by me in reaction to a discussion on the function of the ritual temple chariot (ratha or ter) used for the display of the gods in the procession of temple festivals in South India. It argues for a cosmological and metaphysical explanation of their form and function. At the same time the ratha or ter, as the chariot is called in Sanskrit and Tamil, is quite mysterious. Structurally it is an upside-down pyramid on four wheels made of wood. On top of this pyramid is a small dais which is also a stepped pyramid, but right side up. For the occasion of the actual festival a temporary upper structure will be constructed of poles which will be covered by colourful cloth. Although every temple has its own specific details, generally these upper structures also have a pyramidal structure and shape. Some time ago a much respected FB friend and fellow enthusiast raised the question why the chariots are sometimes so huge, while the murtis which ride in them for the processional ride around the car streets are not very large at all. This is a very good question. The general question of the relationship between the form, function and meaning of the South Indian temple chariots has so far hardly been asked. Searching the literature we have to draw the conclusion this question has not enjoyed any attention so far. So I thank my FB friend for bringing it up. From my late friend Raja Deekshithar I understood the essence of this a long time ago. But the time, and also the material or textual proof was not ready. During one of our recent trips we accidently came across one crucial proof. 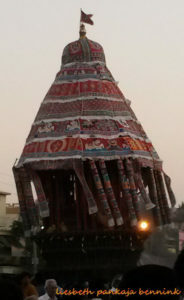 The ritual ratha, ter or chariot is first and foremost a physical representation of Meru, and Meru is the Cosmic Mountain and World Axis. What is the proof for this? 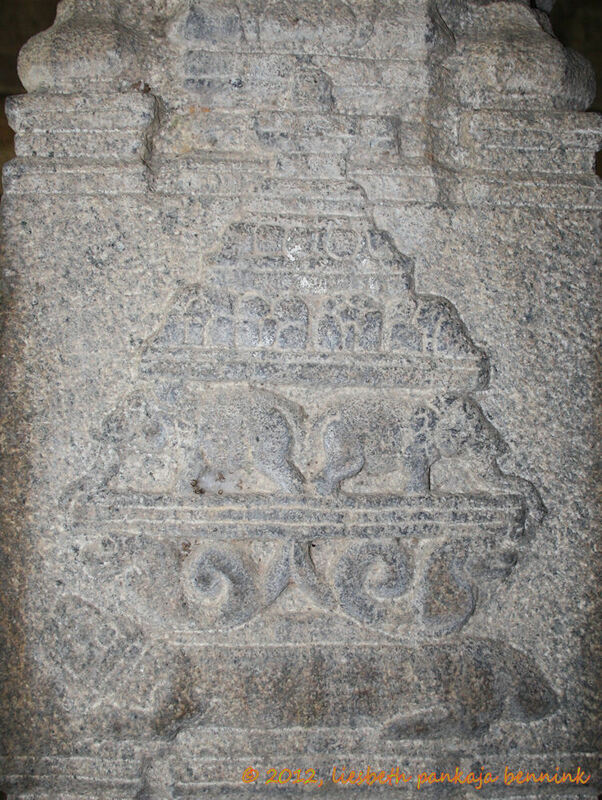 Two reliefs depicting Meru in a simplified form establish the connection. The first Kandhan and I found in an eclipse pavilion on a short trip to Tiruvannamalai. 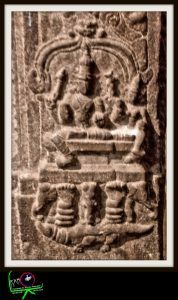 This alone standing mandapa somewhere along the road has the usual eclipse depictions of nagas with lunar and solar disk, makara, fish and other eclipse symbols besides cosmological symbols. 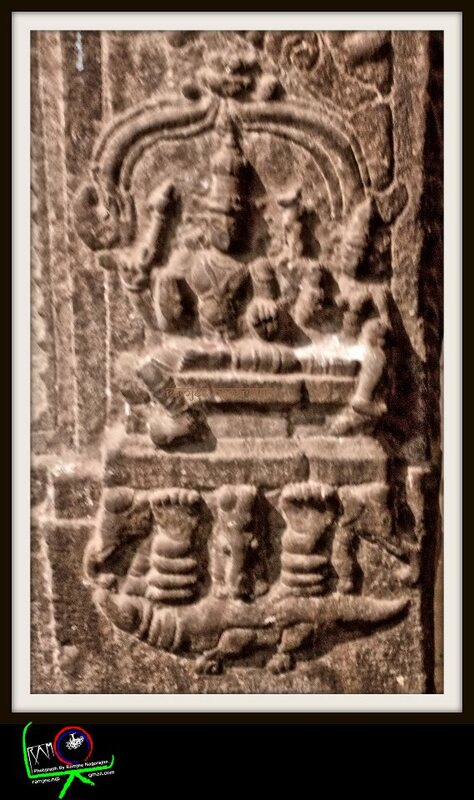 One is a small relief of Meru with the Shiva Linga on the summit. The relief from Madurai which was posted by Ramjee Nagarajan depicts another interpretation of the same idea. Here the Cosmic Tortoise carries the Nagas and the Elephants on whose backs Shiva and Parvati are depicted as Somaskanda or as Uma-Maheshvara. (I am not sure Skanda is present here in between his father and mother, a more detailed photo could clarify this)(fig.2). 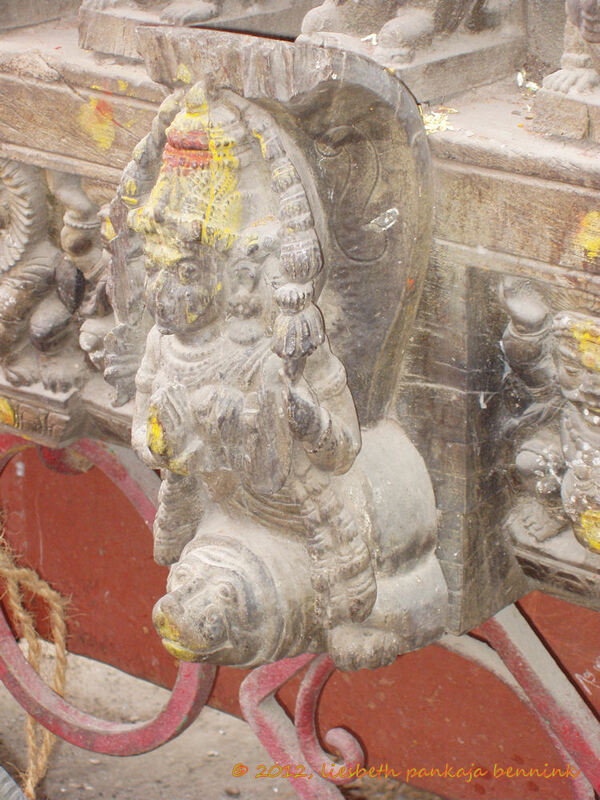 That this is a depiction of ancient cosmological concepts can be understood from some of the ritual platforms we find in festival mandapas, for instance in Madurai itself. 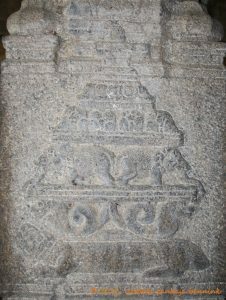 In the Thousand Pillar Hall the large stone Nataraja and Sivakamasundari are placed on a ritual platform shaped in the form of the Cosmic Tortoise. The Cosmic Tortoise carries on its back the Cosmic Nagas and Elephants, and the Dikpalas, the Lords of the Directions are positioned at their appropriate places. Atogether this forms the platform which is the stage of Shiva’s Cosmic Dance. 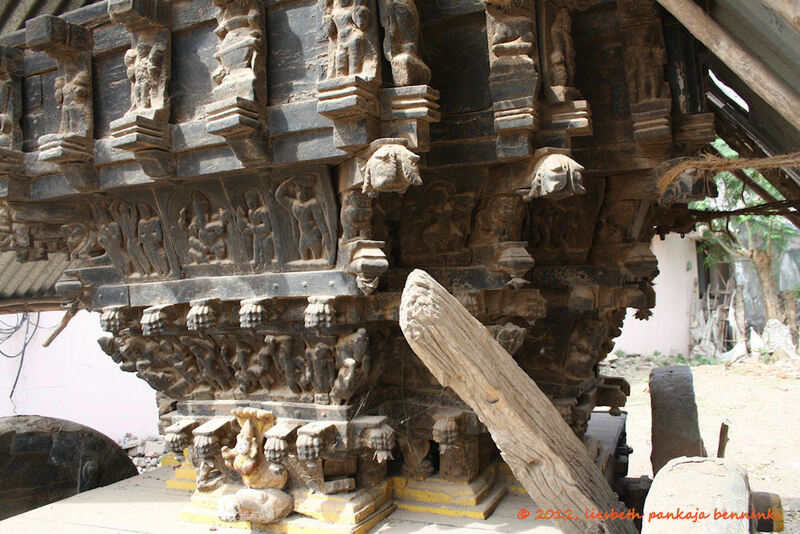 Another such platform is found in an eclipse pavilion in the outer prakara of the lower temple in Thirukallukundram. Alas Time has robbed this Cosmic Tortoise of its head. Nagas, Elephants, the Lords of the Directions, and miniature mountain peaks complete the symbolism of the Cosmic Meru. It was obviously a platform for the performance of ritual. Possibly in connection with eclipses, as an eclipse is depicted in the ceiling above the ritual stage. Now what is the connection between these depictions of Meru and the festival chariot? The chariot actually represents the same concept. Not on all chariots we find all the symbolism combined in the same way, but many do, and they make the connection clear. Here I present two chariots. Both are from Chidambaram. The first is the large chariot for Ganesha which belongs to the great festival of the Shiva Nataraja temple. The other is a small chariot belonging to a Vinayaka temple some distance away from the great temple in the centre of the city. We again find the Cosmic Tortoise carrying the whole universe on its back. Here the tortoise is also depicted in human form, it seems. On its back nagas and elephants, and above these the whole cosmos of worlds with heavenly beings and deities. I don’t have a photo of this, but the tail and the feet of the tortoise stick out at the back and the sides of the chariot. The second chariot also has the human form of the Cosmic Tortoise represented. On its back once again the Nagas, the Elephants and miniature mountain peaks. This small chariot clearly shows the inverted pyramid structure and the layers of divine worlds. We can conclude the ratha or ter of South Indian temple festivals is a representation of the Cosmic Meru, which is at the same time the world axis, the skambha. Both the Tortoise and Meru itself are other forms of the divine. The size doesn’t seem to be as significant. 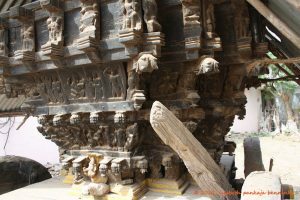 Possibly bigger chariots were build for the larger temples, in the same way the gopura seems to have become higher over time. I hope this clarification of the meaning and function of the ritual festival chariot will help us all to understand the significance of the ancient traditions better. And the next time I pull the chariot with the Nataraja in it I will realise all the more He is the embodiment of the whole cosmos. And the festival is its unfolding.